The McDougal family is missing – Mark, Louisa, and their adopted daughter, Lily. A concerned uncle writes a letter – a desperate plea for help in finding his relatives. Welcome to Dark Tales: Edgar Allen Poe’s Morella! The basic backstory is that the house was built on a plot of land believed by locals to be the gateway to the spirit world. One day, basked in creepy greenish glow, the house was sucked into the ground and then popped back out. All the occupants seem to disappear. The police took one tiny peek in the creepy house and fled in fear, but you and Dupin are hardened detectives and don’t let a few evil spirits and stories of possession deter you. As you storm the house, you see Dupin get sucked in through the front door amidst howling spirits and clanking chains. A wall is quickly built, blocking your entrance. Great. Now you’re on your own in finding a way in and locating and saving Dupin. Be wary – evil spirits and a child seemingly possessed work to stop you every step of the way. Upon your entrance into this delightfully creepy story – you are pelted with rain and wind as if the elements are trying to stop you before you even reach the house. Superb graphics pull you into a world of darkness and evil. Clever details like mist swirling at your feet and a greenish cast to a dreary brick house make you feel like you really are stuck at this hellish address, with no way to go but inside. A little girl with blackened eyes and a bloodstained dress greets and taunts you more often than you’d like every step of the way. She is flanked by howling souls that swirl around her and are clearly ready to do her bidding. Ghoulish statues adorn the house, both inside and out, sometimes holding items you need. And although the graphics are well done, the voices seemed a little forced rather than creepy. The wailing of Mrs. McDougal was a little grating, and the voice of the creepy child is likened more to a child with an attitude problem, not one possessed. I will say the ghouls voices were well done though. The ambiance is chilling. 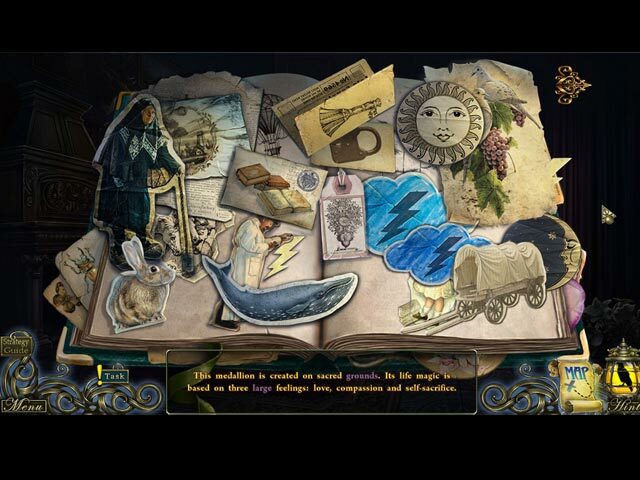 Like many of these dark hidden object mystery games, the colors are muted, with greys, dark purples and greens that cast frightening shadows on your surroundings. Crows caw mournfully in the background and a piano plays a sad tune. Not much light fills the house, the fire is out, and the surroundings seem very dreary – a perfect haunted house setting. 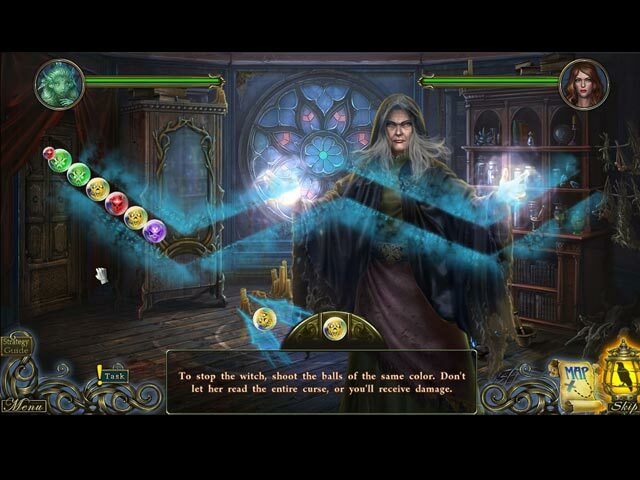 The hidden object games are not plentiful – but there are a good amount of mini games. They are pretty unique and fun to play. Other tasks include finding 60 fortune cookies – each one holds a puzzle piece and a fortune – or a prediction. Usually the predictions happen soon after you find them, so it’s in your best interest to look for them. You also unlock achievements as you accomplish tasks. 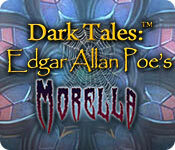 Dark Tales: Edgar Allen Poe’s Morella has a wonderfully sinister ambiance and creepy surprises behind every corner. Although some of the voiceovers could have been a little better, it was still fun to play. 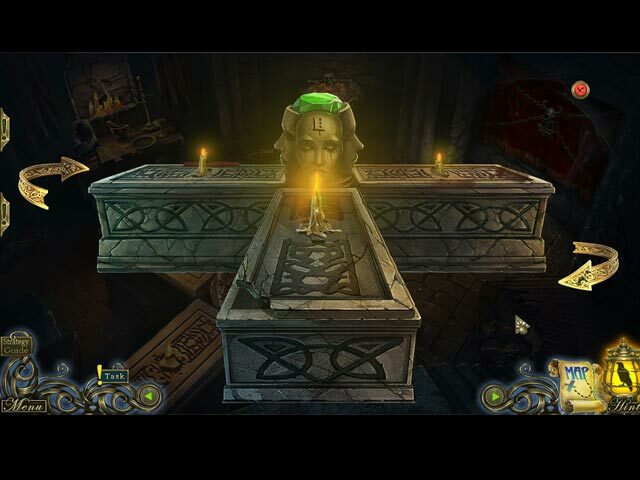 If you like ghosts, ghouls, and a sinister mystery hidden objects game, then try this one out!